Here is some information about Gillian Weir from gillianweir.com which you must visit! 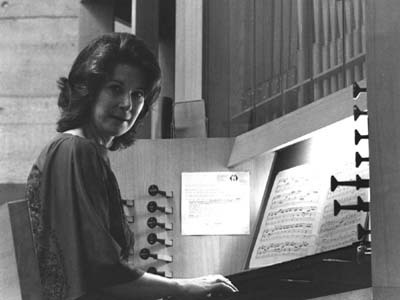 British concert organist Dame Gillian Weir is one of the foremost musicians in the world today. Combining natural talent, study and hard work along with copious amounts of grace, charm, and wit, she has defined an entirely new role as an ambassador for the King of Instruments and its music. Through her performances with leading orchestras and conductors, non-stop recital tours, public television programmes, interviews, recordings and master classes, Dame Gillian has transformed the image of organist from esoteric musician to beloved celebrity. Performer, scholar and teacher, she has opened the eyes of the world to the music of the organ with her extensive travels and tours throughout Europe, North America, Australasia, and Japan.